Capstone3D believes that the spaces around us can have a profound effect on the quality of our life experiences. We see ourselves as stewards, committed to creating and operating uncommon spaces that both enrich and inspire. Accordingly, we have organized our brands into three segments, each a distinct expression of our purpose: to create Space for Life. Our pluralistic brand architecture model allows our brands to have a strong, unique market presence, while also leveraging the synergy between them — to the mutual benefit of each other. 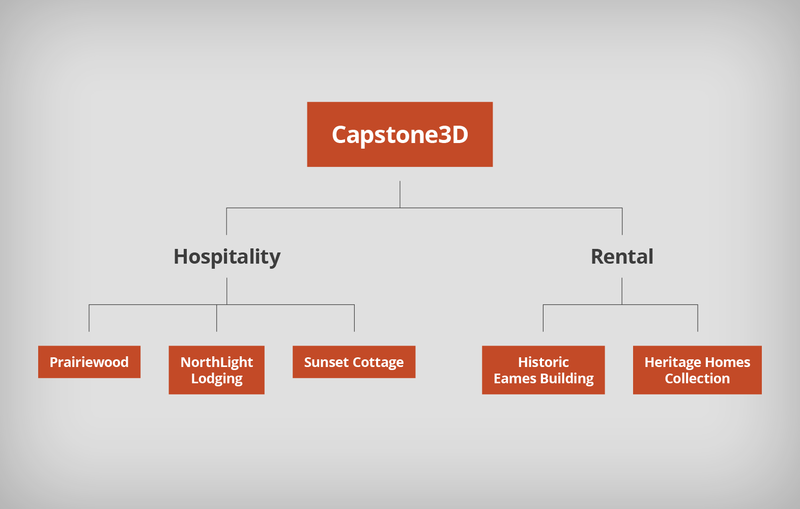 As the parent company, Capstone3D serves as the umbrella to these three segments, each driven by the same hospitality-infused, experiential, user-centric approach. Our signature accommodations, event spaces, and getaways — including Prairiewood Retreat & Preserve, NorthLight Lodging, and Sunset Cottage — are housed in our Hospitality segment. We offer one-of-a-kind apartment homes and commercial space through our Rental segment, which includes Tecumseh Lofts, Heritage Homes Collection, and Historic Eames Building. Lastly, our Residential segment currently encompasses our flagship development Enclave at Grand Mere. All three embody our core values of purpose, authenticity, simplicity, stewardship, connection, and gratitude. If you’re interested in learning more about our values-driven organization and how we create Space for Life, or in talking with us about becoming a strategic, missionally-aligned partner, please contact our co-founder, Kail Katzenmeier, at 785.341.6091 or kailk@capstone3d.com.